The story of Alice Stuard is one of those told in the exhibition "Extraordinary Women" to be held at St Nicholas Church in September 2018. Alice Stuard died in 1483. She was a widow. In her will Alice left at least 77 Sheep and a pair (Yoke) of Oxen and a cow along with land and buildings and cash. 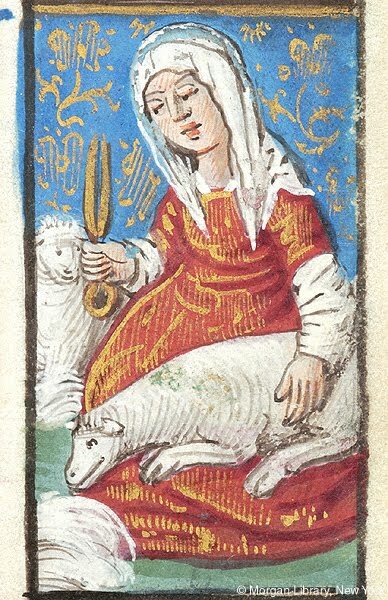 Sheep were a hugely important part of the economy of Sutton throughout the 14th and 15th century. Alice would have grazed her sheep in the south of the parish were the chalk downs started to rise towards Banstead. The wool from the downs sheep was of high quality and the Abbot of Chertsey (Lord of the Manor of Sutton) kept 1,500 on Banstead Downs during the 14th Century. The sheep would have been sheared between mid-May and mid-July and Alice would have bundled her fleeces together to take the market. 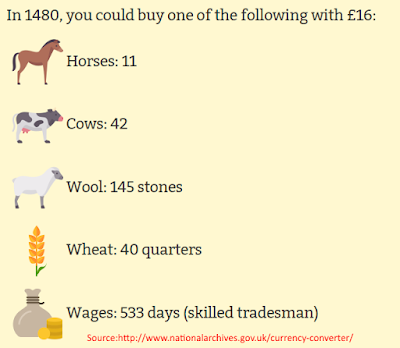 It takes about 20 fleeces to fill a wool sack (weighing about 60 kg or 132 lb) and a mule would have been able to carry two sacks. Alice would have been lucky to have got £4 for each sack at the market. 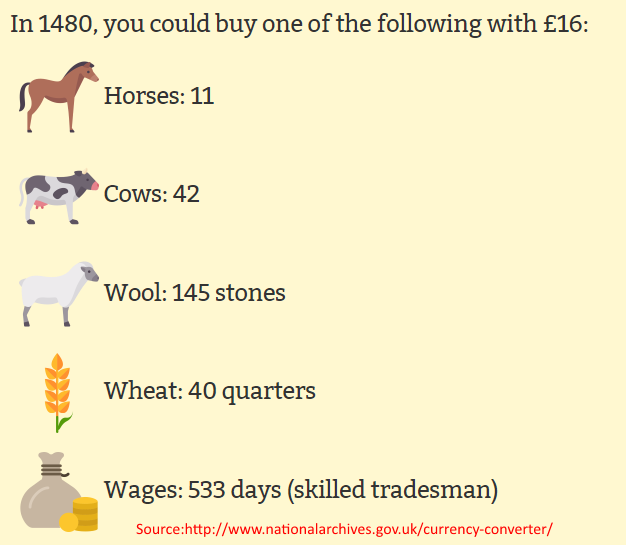 But she was able to send 4 sacks of wool to market and so could expect to earn £16 in 1480. The will of Alice Stuard, widow, of Sutton. 05 Mar 1483[-4]. To be buried in the churchyard of Sutton. To the said church a coverlet. To the reparation and upkeep of the said church 20 sheep. To the high altar of the said church for my tithes forgot 12d. For the maintenance of the light of St. Katherine in said church one quarter of malt. To the mother church of Winchester 6d. An honest priest of good fame shall celebrate in the said church for an entire year, for my soul and the souls of all my friends ---. To the said church 4 torches. To each of my godsons one sheep. To Alice Hychecok my niece 3 sheep and one red cow. To Walter my servant 4 sheep. To Richard Stuard one large brass pot. To Nicholas Broke and to Emota his wife, my daughter, 20 sheep, a yoke of oxen and all my utensils. To John Hall 2 sheep. To William Mayre 2 sheep. To each of the sons of Thomas Wode one sheep. To each of the sons of Richard Cooke one sheep. To William Playstow one sheep. To Henry Taylor 2 sheep. To Joan Bolke one sheep. To John Pownde one sheep. To Giles Crowcher one sheep. To John Stuard 2 sheep. To each of the sons of John Gildon one sheep. To Richard Stuard 3 sheep. To the repair of the highway in Sutton 6s. 8d. To Matilda Dunnyng 2 sheep. To Thomas Hichecok 2 sheep. To Robert Hanwcell 12d. To Roger Morys one sheep. To the wife of John Smalley 2 sheep. I will that Richard Cooke and John Buckeley, my feoffees, shall deliver to Nicholas Broke and Emota his wife a sufficient estate according to law in the whole tenement called Pepers with its appurtenances in Sutton to hold to Nicholas and Emota his wife during the life of said Emota with remainder to Richard Stuard son of John Stuard and the legitimate heirs of his body with remainders in default to John son of said Richard Stuard. To John Stuard son of Thomas Stuard, and to the right heirs of me the said Alice for ever. Robert Gildon to have a certain tenement in Sutton called Stowtes with its appurtenances to him and the legitimate heirs of his body and in default to my right heirs. Richard Cooke and his fellows my feoffees shall give Nicholas and Emota his wife a lease in a croft of land called Northrusshmede in Sutton to hold said croft of land with its appurtenances to said Nicholas and Emota his wife for her in survivorship to find yearly three wax candles each 2 lbs. in weight to stand before the images of St. Mary the Virgin the crucifix and St. Nicholas in the church of Sutton. The said Nicholas and Emota shall have all those lands called Gaddes in Sutton until one Richard Stuard shall come to the age of 21 years at an annual rent to the use of said Richard according to the discretion of my feoffees. Richard Cooke and Nicholas Broke, Executors, for the welfare of my soul. From Volume 36: Archdeaconry Court of Surrey. Wills: Spage Register.